A new image of the Prawn Nebula from the European Southern Observatory in Chile shows two blue giants - O-type, very large, very hot stars. 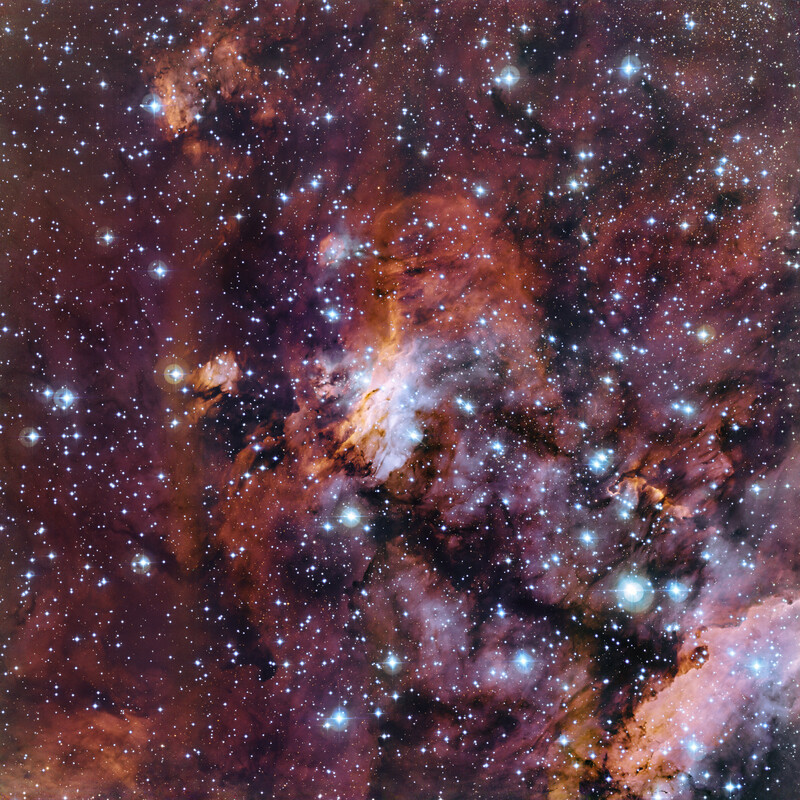 The Prawn Nebula IC4628 is located 6000 light-years from Earth. It is a nebula that emits its own light in the optical spectrum - an emission nebula. Other nebula emit no light at all, and some are lit by nearby stars. The Prawn Nebula blue giants1 release large quantities of UV emissions that ionizes hydrogen gas in the nebula. As the hydrogen nuclei and electrons recombine, additional energy is released in the form of light - the source of the nebula’s glow. The Prawn Nebula is huge, spanning 250 light-years. The dense clouds in which star formation is particularly active were formed during a supernova; so the stellar life cycle is visible in the supernova. It is found in the constellation Scorpius - Location in constellation. The nebula is large, about four times the size of the full moon; although it is so faint that even small telescopes cannot see it. I am a homeschool parent, medical doctor, pianist, violinist, iOS and Mac developer, instrument rated pilot, road cyclist. Why Is the U.S. Obsessed With Home Ownership?